Join the legendary Baron Munchausen as he journeys to the Moon and the Sun, rides cannon-balls through the air, defeats entire armies single-handed, meets gods, and escapes from bandits on half a horse. In The Extraordinary Adventures of Baron Munchausen players must compete to outdo each other’s feats of eccentric heroism and surreal derring-do, while avoiding obstacles and pitfalls placed in their path by their companions, stretching the bounds of truth until they twang. How is this possible? If Baron Munchausen is involved, anything is possible. It’s a unique and hilarious storytelling RPG, written by Baron Munchausen himself, with simple rules, fantastic artwork, and thousands of fans around the world. 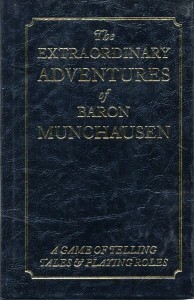 The Extraordinary Adventures of Baron Munchausen contains full rules, more than two hundred adventures ready to be played, game mechanics that replace dice with money and fine wine, quick-start rules and a great many insults against the inhabitants of various nations, but principally the French. 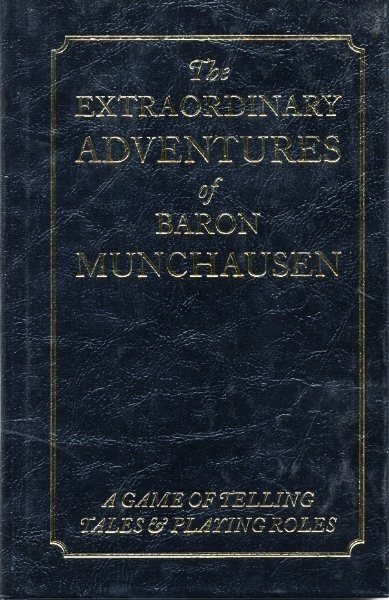 The original edition of The Extraordinary Adventures of Baron Munchausen was released in 1998. It was nominated for Best New RPG in the 1999 Origins Awards, has been translated into six languages, is one of only three RPGs ever published by The MIT Press (yes, that MIT Press), and has been a collectors’ item for years. This new edition, a facsimile of the suppressed 1808 printing, is more than twice the length of the original game. It adds rules for playing the game in an Arabian style and a complete supplementary game, ‘My Uncle the Baron’, designed for children, the inbred and those who are very drunk. “Utter brilliance in RPG form!”—John Kovalic, creator of Dork Tower. The first 1000 copies are a limited-edition hardcover with a leather-effect binding embossed in gold, known as the ‘Gentlemen’s Edition’. This edition is now sold out. The rest of the print-run, the ‘Wives’ and Servants’ Edition’, are softcover, with a simple black-on-white cover shown above, so as not to over-excite the delicate sensibilities of ladies, domestics and the lower orders. One illustration from the Gentlemen’s Edition has been omitted at the Baron’s instruction, due to its salacious nature. Copies of this book are available from selected retailers and also on the internet. A digital edition of the book—the ‘Difference Engine no.3 Edition’—is available in a deluxe package from e23, the digital warehouse of Steve Jackson Games for $10.95 (click here to go to its download page) or from DriveThruRPG in a slightly different package (click here to go to its page), priced $10.95. Any hardcovers of the Baron RPG left?